According to the National Highway Traffic Safety Administration, children have to be in appropriate seats in a car until age 6. Rear-facing seat until 1yr or 20 lbs. Forward facing child restraint until 5 yrs or 40 lbs. Booster seat until age 6 yrs. I have recently discovered that my baby car seat, the Graco Snugride (the highest rated baby seat by Consumer Reports), which I thought was intended to last through a child’s whole first year, should actually only be used until the child is 22lbs or 29 inches long. My son is four months old, and is already 27 inches long, which means that I have to go shopping for the next car seat quite soon. There are “convertible” car seats on the market which can be used from when a baby is 5lbs until he/she is 40-65 lbs, depending on the seat. 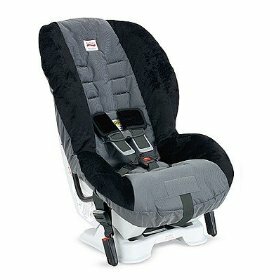 After doing some research, I learned that Britax brand car seats have great safety ratings according to Consumer Reports. 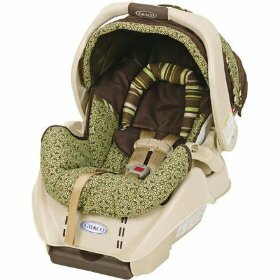 Britax car seats tend to be expensive ($230-$310), but they will last for years (4-6, depending on the seat), can be mounted to be rear-facing or forward-facing, all recline allowing your child can sleep comfortably. Try out the seat you buy. If it doesn’t fit securely in your car, return it for another. To make sure your car seat is positioned correctly in your vehicle, consider getting a free car-seat inspection. For a site near you, go to www.nhtsa.gov. Adjust the seat as your child grows. Position your child in the center-rear seat of your car if the car seat can be securely fastened there. I found a great article from Consumer Reports about various types of car seats, installation advice, and safety recommendations. Read the full article.